1- Qos by DiffSrv : When no congestion on Leased-line ( traffic < 10 Mbps), Qos no affect ? or http traffic going to high priority only when have congestion ? 2- QoS by InterSrv : If i config 2 Mbps for RSVP, allway have only 2 Mbps for http traffic , if over 2 Mbps, it drop . Others traffic can using 8 Mbps ? Your explanation seems to be correct. You have understood the concept correctly. I have a question on rather Integrated Services (RSVP) can be used in MPLS to identify Real Time Protocol (RTP) traffic like voice or video to give it preference over other traffic. I read your explanation on Resource Reservation, and Admission Control. I’m not understanding how RSVP is used to give RTP traffic that is sensitive to packet loss, jitter, and latency priority over other traffic. Could you explain how this can be done? There is a SIP session that is initiated between two user agents (UAs). These can be phones, gateways, conference bridges etc, anything that will terminate a SIP session. The SIP session begins with INVITE, SESSION PROGRESS, and PRACK OK messages between the two devices. 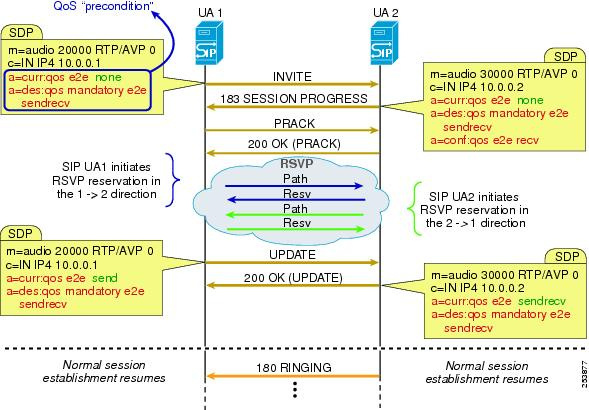 Once that is done, the SIP UA1 initiates an RSVP reservation to UA2. This process involves all RSVP enabled routers between the two devices. Once that has successfully been established, the SIP session continues with an exchange of UPDATE messages, and then the phone rings. So RSVP takes place chronologically between the initialization of the SIP session and the beginning of the actual telephony communication starting with the ringing of the phone. Call Admission Control chapter of 8.x SRND. Thanks for the detailed explanation. It makes since. The documents are also helpful also. I’m going over them now to get a better understanding of RSVP.